Kate Adams' interest in quilt making was fostered at a very early age by her mother and grandmother. As accomplished needleworkers, they passed on this love of textiles to Kate. In the rural Northern California dairy farming community in which she was born and raised, needlework skills were held in high regard. These skills learned at home and in the local 4-H club, helped Kate acquire an apprenticeship with a local costume maker. This experience, along with spending several years as a volunteer in small community theaters, helped to better develop her own skills and personal style. Early in her twenties, Kate found herself working full time for the Living History Center in Marin County, California. This non-profit organization produced such events as the Renaissance Faire, the Dickens Christmas Fair, and several "environmental theater" productions. Her job as first assistant later evolved into becoming head of the costume department. She left that position in 1978 to form her own freelance clothing and costume design business in the San Francisco Bay area. After years of running a modestly successful business, the competition of the fashion and costume trade started to lose its appeal and Kate sought other means of using her talents. A chance request for a one-inch scale quilt for a young friend's doll house launched Kate onto the path that she is following today. Once again employing her love of 19th Century style quilts and her interest in history, she developed designs to market to adult collectors of finely crafted one-inch scale miniatures. In 1989 Kate was asked to display her work at a traditional American folk art show in Pennsylvania. "For this event, I opted to use remnants from my collection of antique fabrics and to present my work matted and framed. I thought this might appeal to a broader audience, and add an air of authenticity and uniqueness to the pieces." This new approach proved to be a springboard for Kate's future success. Today the Miniature Quilts of Kate Adams are in many of the finest private collections of folk art in America, Japan and Europe. 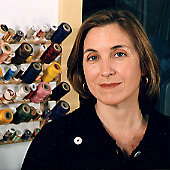 Her work is marketed through such distinguished institutions as the American Museum of Folk Art, Colonial Williamsburg, the Brandywine River Valley Museum and the Shelburne Museum. Kate's work has also appeared in many national publications such as Country Home, Victoria, and Colonial Homes magazines. 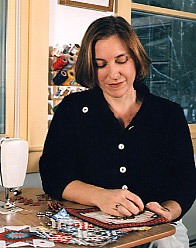 Her work has been included in the Early American Life Directory of Craft, along with being featured in Robert Shaw's book, Quilts - A Living Tradition (1995.) Her work is also shown in the Williams Catalog of American Master Craftsmen, 2002 edition.